Antique Road Trip USA is rated 3.9 out of 5 by 28. Rated 5 out of 5 by denniann2 from a good relaxing game it has many different ways that you play and you don't get bored. there are HO scenes and find multiples scenes and riddle scenes. i played casual. the music is kind of repetitive but i usually don't use it anyway. hints charge quick. you have a little dog, sandy, that guards the hints the mini games are easy!!!. they travel across the nation looking for antiques and helping others out with theirs. i like most of the road trip games. Rated 5 out of 5 by Mrs_Kim from Definite fun! I am not a fan of antiques but this game is an exception. Very nice background music, simply storyline yet very fun, and lots of interesting fun minigames to play. The game looks short but actually pretty long. The couple in the game visits different places at random and the levels unlocked as we play further into the game. I love that we can decorate the shops, and the games although quite repetitive in method, lets us see lots of antiques and vintage items, for me as an Asian, it's very interesting. The minigames are also getting difficult as we progress. There is no skip button in this game, but Sandy, the very cute puppy, will give hints on how to solve. I buy this game using the free game coupon so this game really doesnot disappoint. Even if you are not fan of antiques like me, you will sure find this game entertaining, fun and a good break from the usual dark, spooky and tensed HOG games. 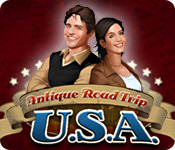 Rated 5 out of 5 by MAG57 from Antique road Trip USA What an enjoyable game! I liked it "all", from the music to the clear scenes. The hint button is cute and helpful. 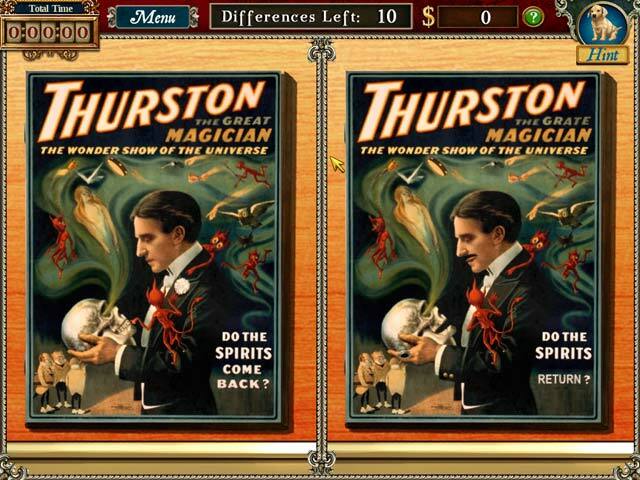 Strickly a hidden object game with some other puzzles "find the differences" "find matching pairs" and more. Nice little story line too. Rated 5 out of 5 by Boomer1097 from Fun Game I really enjoyed this game. It is a great change of pace! You are traveling the country helping friends and gathering money to open an antique shop. You play some HOS, some mini games, some match games, some find the difference games and some find 25 of a certain object games. The hint button is adorable...it's a puppy. When you use the hint button, the puppy plays with it's chew toy until the button recharges. There were times I used the hint button just to watch the puppy! Some of the HOS and find the difference games were difficult, which added to the fun, You also get to set up the antique store, which is fun. The graphics are acceptable, nothing high tech. The music is somewhat annoying. I muted it after 5 minutes. There aren't any voice overs, which was a nice change of pace. This is a great game for those times you want to play a low stress game that is absolutely fun. Rated 5 out of 5 by Do_The_Dew from Take a Trip I love this game. It's challenging at times and that's good. Must keep the brain working. Putting together an Antique Shop is very fun. I must get the next one and see if that is just as fun. Rated 5 out of 5 by TheOldWife from Let's Hit the Road I loved this game. I enjoyed decorating the antique store. 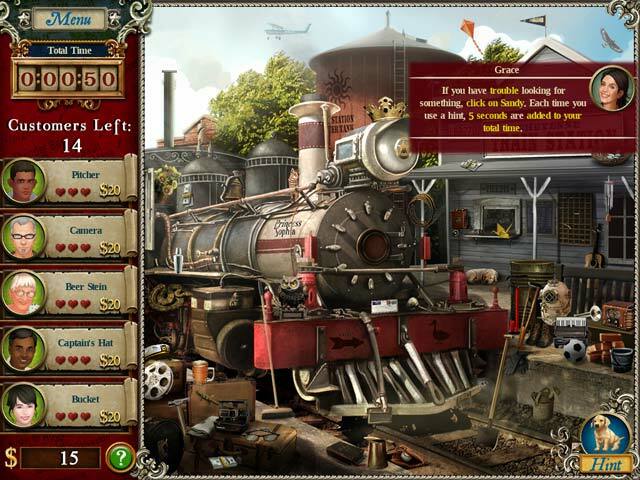 Enjoyed hidden object scenes from different parts of the country. I also liked the post-game play: finding all the hidden objects in a scene. Rated 5 out of 5 by BunnyLovesTed from Makes Me Want To Hit The Road! I have come to love hidden object games, but I really don't like the mystery or spirit world ones. It's refreshing to come across a HOG that doesn't focus on the same thing 90% of the other games do. So, about Antique Road Trip, I found the story good and somewhat plausible. A newlywed couple have opened an antique shop and must fill it with merchandise. They do this by going all over the country to help friends with tasks to earn money (this is where the hidden object scenes come in) then you use the money to outfit their store, I really liked that part. Once the store is completely outfitted the game is basically over, however, I found you can keep playing scenes and earning money but it really doesn't do you any good as far as the story goes. I'm really looking forward to playing Antique Road Trip 2. Rated 5 out of 5 by Bpup from Family-Friendly Hidden Object Game Finally got around to playing this game and I have to say, what a pleasant surprise this is. It's a very nice change-of-pace from all those dark and gloomy HOGs I've been playing lately. I like the music even though country is not generally my thing; I've always had a softspot for bluegrass and the banjo, though. I like the fact that you can take a break from the HOG scenes and play decorate-the-store for a while. I've been happily buying multiple versions of items and constantly rearranging my store to suit my taste. The mini-games are fun ones - jigsaw puzzles, pick out the matching/dissimilar items, find 25 of this or that - no great strain on the brain or stress-inducing in anyway. This is a great game to play when you're in the mood for a hidden object game but you don't want to commit to, or have time for, immersing yourself into a whole hidden object-puzzle-adventure (HOPA) game. It's just as much fun if you play for a short or long amount of time. Rated 5 out of 5 by Katspaaa from Not Bad! True it does seem to be endless but then, you got your moneys worth! I like it!! 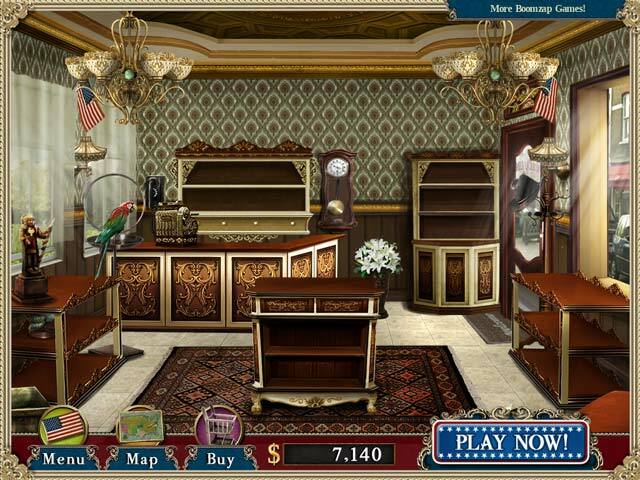 Rated 4 out of 5 by JulzCat from Realize Your Dream Of Owning An Antique Shop! I love games that allow me to decorate. This is an older HOG, with simple graphics, but I really enjoyed it. There were also a few puzzles thrown in. The best part to me was earning the money to upgrade my antique shop. I kept playing even after the story was over (which you can do from the map) so I could put the finishing touches on my shop. Thankfully, you can play timed or untimed. Also, I enjoyed that my city, Charlotte, was on the map but laughed because they put us near the coast (which we are hours away from, LOL).